The Bulkington Wargaming Club was established in 1998, following the closure of the Bedworth Wargaming Club. At the present time we have approximately 21 regular members, who play a variety of games, but primarily those produced by Games Workshop. Below you will find details of the games that are played at the BWC but any kind of wargame are welcome, new games are always greeted with enthusiasm. We have a growing selection of Terrain, mostly built by club members, but we do own a selection of modular terrain by Purbeck Terrain Systems. We intend to get more commercial terrain when the funds allow. We do not charge a membership fee, the club is open to all who are interested, however we do charge an attendance fee of £1.50 (Free for your first visit), with membership being achieved by regular attendance (see the Club Rules for more information). Membership gains certain privileges at the club the most regular of these is the Members Raffle. On the first meeting of every month every Member is entered into a free draw, the winner receives a Games Workshop Gift Certificate, but if they are not there to collect the prize another name is drawn out. As you can imagine attendance gets a boost at the beginning of every month. As we have mentioned the majority of the games played at BWC are those produced by Games Workshop, but other games are also enjoyed and welcomed. Warhammer Fantasy Battle - With the new edition just released Warhammer has become "Flavour of the Month" at the club, we are currently assembling a Vampire Counts Army for the club, and we are running a Ladder League open to all. Warhammer 40,000 - One of the most popular games at the club, there is almost always a game on. Warmaster - A very popular game here, between the members of the club we can assemble all six armies (from the rules) all at a minimum of 2000 points. The BWC put on a big Warmaster game at Games Day 2000, you can read about it here. Necromunda - This game has died off a bit, but games are played now and again. 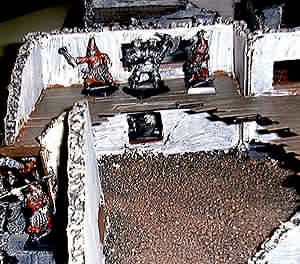 Mordheim - At one time everyone was playing Mordheim, the club even made some purpose built terrain. Not many games are played now, but every now and then it picks up. Battle Fleet Gothic - This game died off pretty quickly, you still get the odd game played now an again. Blood Bowl - A regular favourite that gets aired every couple of months. Full Thrust - A Starship Combat game by Ground Zero Games that is relatively new at the club, but is gaining fans rapidly, it has brought many of the Battle Fleet Gothic ships out of the closet. The easy and fast game play has aided its poularity. Car Wars - A game of Car Combat on the freeways of the not too distant future  by Steve Jackson Games. This game gets a good reception when ever it is played, but as only one person runs it, this isn't often enough. These are just a few of the games that we play.